Does anyone remember the ‘American Concorde’, Boeing 2707? The aviation industry would be very different if the ambitious plans of the 1960s had come to fruition. For a start we would all be flying around in supersonic aircraft such as the Boeing 2707. Designed as a competitor to Concorde, the Boeing aircraft was designed to fly much faster and with a higher passenger load than the British and French aircraft. It never got off the drawing board. The people who put together the video of the de Havilland Comet 1 last week also produced this one. 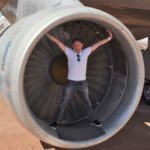 It provides and interesting look at the American Supersonic programme and why the aircraft never flew. With a design requirement to fly at a speed of Mach 3, it promised speedy trips for all. A larger three abreast cabin was planned, with state of the art inflight entertainment such as televisions at every seat. Such high speeds would have required the use of titanium for the fuselage which is very expensive. Also, the design featured swing wings which added complexity. Eventually a simplified version was designed using a delta wing like Concorde. However, the project was eventually cancelled resulting in substantial job losses and a waste of money. Virtually every major airline in the world placed options on the Boeing 2707. Nobody wanted to be left behind if supersonic travel became a roaring success. Of the airlines on the above list, the following also ordered Concorde. Air Canada, Air France, Air India, American, BOAC, Braniff, Continental, Eastern, Japan Air Lines, Lufthansa, Middle East Airlines, Pan American, Qantas, Sabena, TWA and United. The world would be a very different place if all of those orders had been delivered. I imagine the people over at Aérospatiale/BAC would have been very happy too! Unfortunately the sonic boom put paid to the dreams of supersonic flight. Being restricted to overwater flight meant many routes in the world could not be flown. Therefore there was no way to profitably use the aircraft. Lots of research into removing or decreasing the sonic boom to tolerable levels has been done in the intervening years and dreams of supersonic flight by regular passenger aircraft still remain. It will be fun if it ever becomes a reality again! Concorde has been retired and the Boeing 2707 remained a dream but it was certainly an interesting era of flight. Did you know about the Boeing 2707? Have you ever flown supersonically? Thanks for reading and if you have any comments or questions, please leave them below. Featured image by Boeing via BBC Future. Order list via B2707SST on Airliners.net. i did CDG to JFK in the 90’s It was amazing ..quiet and the horizon was gray. The food and champagne amazing!! !And so fast…The bathrooms were large..only negative people could smole!! Yes, Concorde was excellent, I hear! Plus always good food and Champagne as you mentioned. You’re lucky to have had the experience – it’s something I would have loved to do. Thanks for the comment!